It would be a crying shame if you didn’t pick the Condor Kondoru Katana up right now! It's a serious sword that would make a stately addition to your sword collection. Any Samurai would be proud to carry this razor-sharp sword. It features a 28 3/4” high carbon steel blade that has a polished finish. The handle is of Walnut and has a textured grip to give you a slip-free secure hold and a Walnut scabbard with a wrapped paracord accent compliments it. 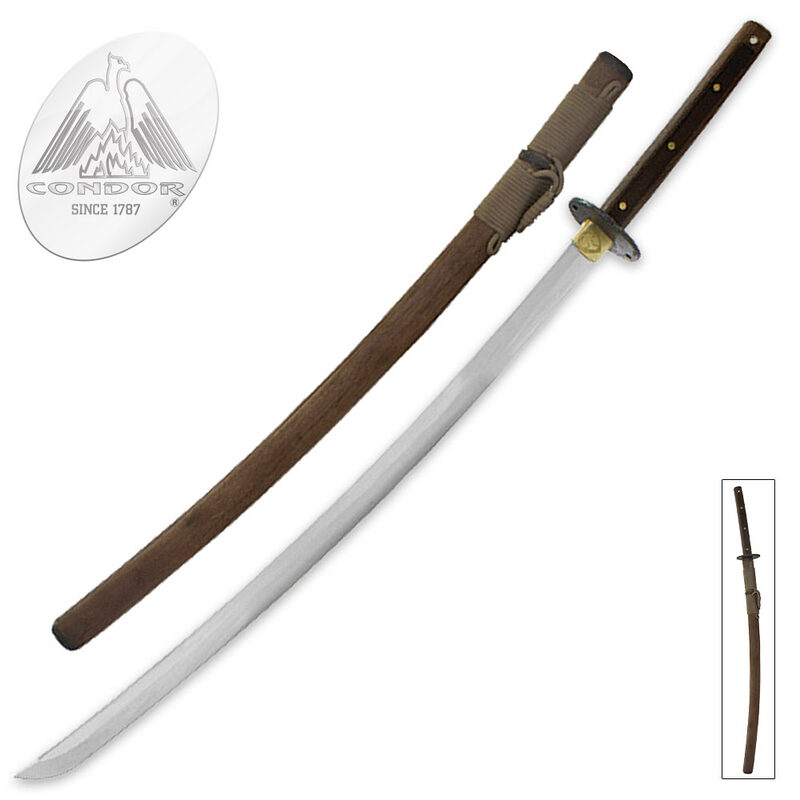 This katana is 38 1/2” in overall length. This sword works really well for pruning smaller branches and practice cutting. On the down side i was talking to someone a little older than me at work about a month ago, and he had a sword collection he had aquired over the years ( aquired not boughten off of the internet). Anyways he was saying his brother had a condor katana and he had a claymore, and they were practice sword fighting. Well he said his claymore chopped his brothers katana right in half! When i got home later i compared my two condor swords, the Dao (Chinese style sword) and the Katana (Japanese style sword). 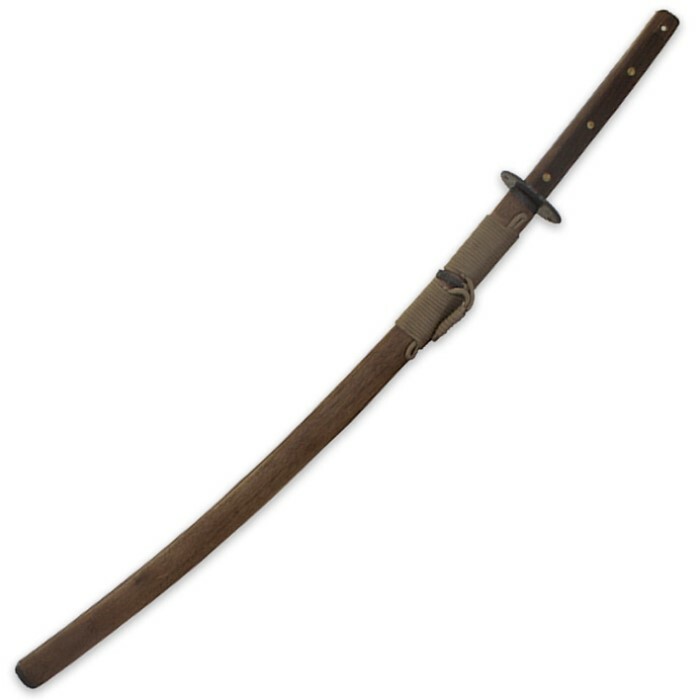 On the Dao, which is quite sturdy, the fibers of the metal run the longways down the blade, and on the katana the metal fibers run the short way across the blade. So a swing against the katana is lined up with the grain, and a swing at the dao is against the grain. If ya guys know anything about chopping or splitting wood, against the grain is tough to chop, and with the grain is much easier to get the wood to split. So this katana ( at least my copy of it) has the fibers running the short way across the blade, and would be extremely easy to cut in half with another sword. From my experience i would recommend buying the condor Dao Do. My copy is excellent and very sturdy, and only cost a hundred bucks. It also looks more promising in a sword fight. If you dont like how much it weighs, then get some muscles!!! =) I can now swing it one handed just by practicing and I built up my arm muscles. You'll adjust to the weight, and something on the heavy side is much much much stronger than something on the flimsy side. Good luck people.